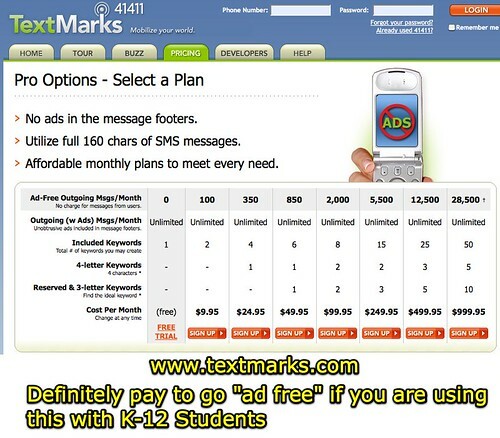 As I mentioned in the screencast, PLEASE NOTE some of the advertisements Textmarks sends for free accounts are NOT appropriate for K-12 students. If you consider ads to “Chat w hot singles HERE” not appropriate for your K-12 students (which I’d argue they are NOT,) university students or other adult Textmark subscribers, I HIGHLY encourage you to pay for a commercial account with Textmarks so you can send ad-free messages. (Note: I am not affiliated in any way with Textmarks. More details about my affiliations are available on my blog disclosure policy.) The lowest priced plan ($10 a month) lets you send up to 100 ad-free Textmark messages to your subscribers with two different “keywords,” which function as “channels” to which people can subscribe. I used a short Google Presentation on my iPhone to introduce this screencast. Have you had experiences, good or bad, using Textmarks or another broadcast SMS solution with students? (If you are a vendor representative of a SMS messaging product, please do NOT leave a comment here. I won’t approve it.) I wish there was a way to setup a keyword/channel which would not include dating related ads.